Hon. 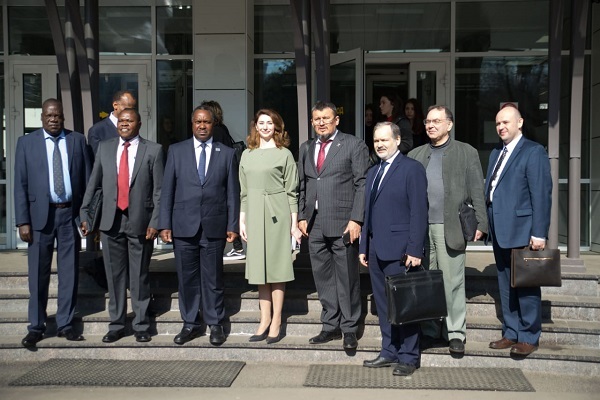 Elioda Tumwesigye, Minister of Science , Technology and Innovation led a Uganda delegation to Moscow from the 09th to 13th April 2019 to sign a Memorandum of Understanding on Scientific, Technical and Innovative Cooperation between Ministry of Science , Technology and Innovation and of the Republic of Uganda and the Ministry of Science and Higher Education of the Russian Federation. The delegation also attended the Moscow International Education Fair, Met the Minister of Science and Higher Education of the Russian Federation and met the Rector of Pushkin State University of Russian Languages. Hon. Tumwesigye made a public lecture at Pushkin State University of Russian Languages on Vision 2040 , Uganda's Development Strategy and how Russia can participate in its implementation. The Hon.Minister also met the Ugandan students in Moscow and the Deputy Minister of Digital Development, Communications and Mass Media of the Russian Federation, Hon. Alexey Volin.